I make my dogs their dog food. It started years ago, long before the big dog food scare. So when that happened (my brother actually lost a dog from that) I had nothing to worry about. I started cooking dog food because our miniature poodle had digestive problems and the only way to fix it seemed to be to cook for him. At any rate, it worked and I have been cooking dog food for about seven years. I have three dogs and while they are all small dogs, it seems like I am always running low on dog food. I wouldn't be surprised if they actually eat healtier than me. Here are the ingredients I gather to start. 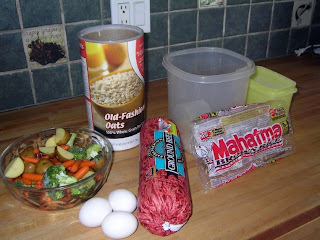 Ground meat (some weeks it costs less to grind my own) brown rice, oatmeal, eggs, a variety of vegetables, and a doggie supplement to include calcium and other nutrients. This, by the way, is approved of by my vet and all the dogs are very healthy. 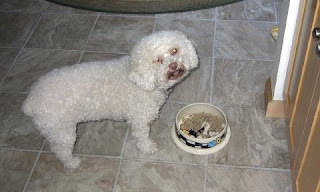 Once I cook the vegetables, I puree them, because the miniature poodle (Charlie) needs to have them disguised. 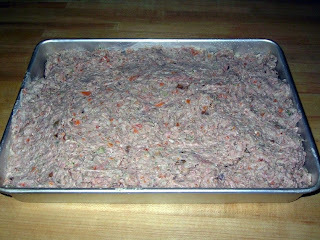 I'm just making a giant meatloaf really. Like here. As you can see, they seem to enjoy the results. 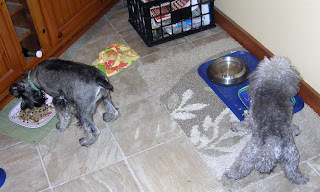 That is the newest member of the family, the miniature schnauzer, Trudy and Charlie who is over 16 now and still loves to eat. Gracie the 6 1/2 year old Poochon eats in another area, because she is the Queen. Did I mention I have very spoiled dogs? Christmas in July in October? Yesterday my friendship group (The Wednesday Wackos) celebrated Christmas in July that was going to be in September but was cancelled until October 28. I guess you can see why we are called Wackos. 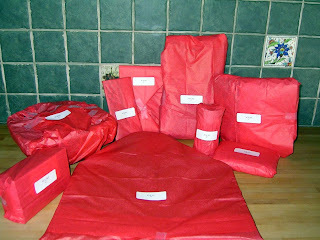 The packages wrapped in red was for my Wacko Sister, Pat Barton. We met at Robin's house and everyone brought an appetizer. Yum! Then we each took turns opening our packages that spelled out CHRISTMAS. Each gift was to represent a letter. Did I mention that we are called Wackos? So you can see where I am going with this, right? Let's just say, we are a creative bunch. My CHRISTMAS gifts had a theme. And a perfect theme for me: Doggies. It may be hard to see, but that little grey guy sitting in the basket is a schnauzer. And, I got schnauzer sock slippers that are soooo cute. All three of my doggies got halloween neckerchiefs. 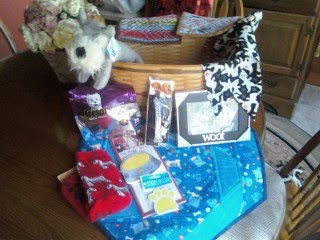 My Wacko Sister, made me two wonderful hotpads and a table topper with, you guessed it, doggies on them. Thank you Pat Morrison for drawing my name. Here we all are. 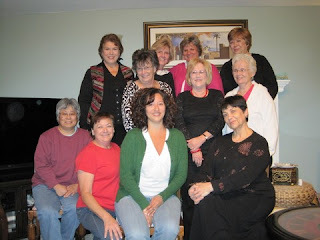 The Wednesday Wackos, a great friendship group who have been sewing, knitting, quilting, and playing together since 2002. 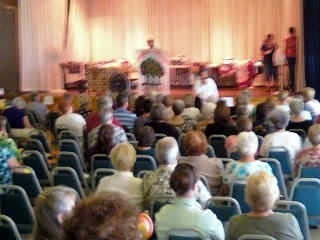 The Orange Grove Quilter's Guild held their Tea and Auction today. And, it was a wonderful event. 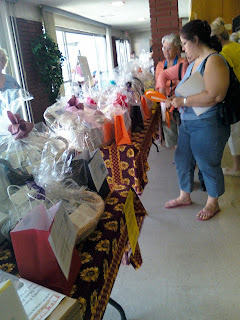 They had 87 quilts to auction (Lyn Mann was the auctioneer and a very good one at that), numerous baskets for rafle (yours truly won one) and a very tasteful guild boutique (I think some of it may have found its way home with me). In addition to the fun of out bidding each other for your favorite quilt, the "Tea" part of it was very nice: great small sandwiches, scones, and many small bite-size desserts. 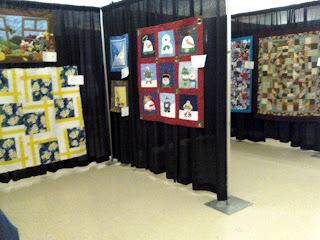 I didn't get an opportunity to bid because I worked in the pick up room and helped collect payments for the quilts. It sure seemed like a successful day for the guild to me. Getting ready for the auction. Thanks for visiting. Hope to see you soon. I have been slack about posting mostly because what I am sewing I don't want to share at the moment. I need another week before I can put up some pictures. However, in between sewing and other quilty business, I have had a few nice outings. One was with an internet friend. 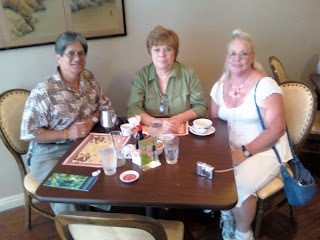 I got to meet Barbara (AKA B2) and her husband Mike. Barbara and Mike live in Oregon and were traveling the West with there cat Trooper. I didn't get a picture. I forgot my camera and I didn't even think about my phone having a camera. So, I probably should not even mention the great lunch we all had at Ester's Taco House in Placentia. http://estherstacos.com/home.htm Trust me, it was nice meeting my internet pal, who is a lovely lady. Of course we also stopped in at Quilter's Garden that is across the drive from Esters. I think we helped the economy a little. I did remember that I had my cell phone with me when my good friend and neighbor, Dee, and I celebrated her birthday yesterday. 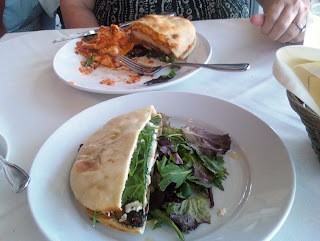 We went to Da Vinci's Restorante in Long Beach. http://www.davincilb.com/ Da Vinci's is located next to the Long Beach Airport and has a great view, especially at night. Take a look at our lunch. Let's see, Dee had a Chicken Parmesan Sandwich and I had a Portabella Mushroom Sandwich. So Yummy! 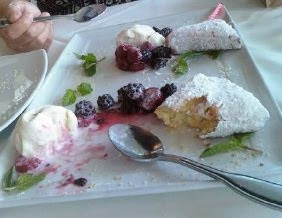 We took half home so we could justify that great dessert. Today I met another internet pal, Cynthia and her husband Raymond. They are here from Arkansas, visiting her family. They are travelling with their two dogs whose names escape me. Cyn and Raymond are leaving California tomorrow. That meant today was the only day left to fit in a lunch at a quaint, and busy, Chinese Restaurant. We also were managed a visit to Quilter's Garden and again added to the economy. Cyn and Raymond are a great couple and I felt I knew her forever. You can see why I hate to have my picture taken. I look like a deer in headlights. The world is so much smaller these days with the internet and the groups you form on Yahoo. I have been able to meet several of my CRAFT friends from all over the world. Very special indeed. Thanks for stopping in. See you here next week. as our guest speaker. And just look at these quilts. She is amazing. 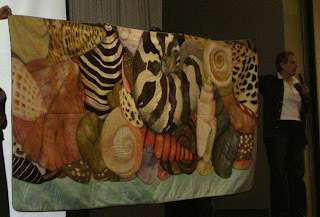 Her work, her art, is a combination of piecing, painting, bleaching, and quilting, some by hand and some by machine. She first shared her journey with a slide show. As you can see, her pieces are very large and the slide show worked very well in this instance. 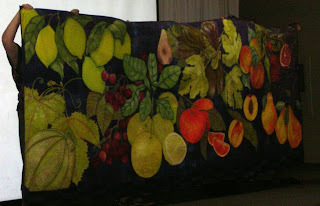 Then she shared four of her quilts so we could view them up close and personal. Special thanks go to Susan Contreras, our Programs Chair, for bringing Velda to our guild so we could all witness this exceptional talent.